Two men were kept from boarding a flight from Chicago to Philadelphia this week because they were speaking Arabic, one of several incidents reflecting public paranoia since the Paris attacks. Maher Khalil and Anas Ayyad were told by a gate agent at Midway Airport on Thursday that they wouldn't be allowed on the plane because a fellow passenger had overheard them speaking Arabic -- and was afraid to fly with them. The two friends reportedly of Palestinian origin and in their late 20s, were eventually allowed on the Southwest flight, but only after being questioned by airport security and police, who Khalil told the local NBC television affiliate he had called himself. Once on board, Khalil said some passengers made him open a white box he was carrying -- filled, it turns out, with sweets. "So I shared my baklava with them," he was quoted as saying. Southwest Airlines told AFP in a statement the flight "departed a few minutes behind schedule" after airline employees "completed conversations with customers who approached us during the boarding process," without providing more details. Similar incidents have reportedly taken place on other US domestic flights in the wake of last week's attacks in the French capital that killed 130 people, which were claimed by Islamic State extremists. The terrorist group, which controls large parts of Syria and Iraq, has also threatened attacks in the US, including releasing a propaganda video singling out New York. 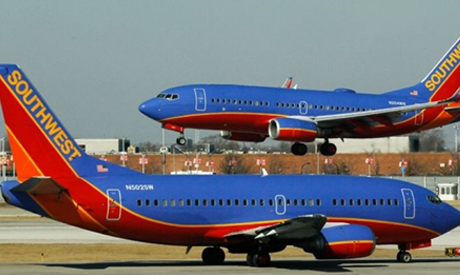 On Wednesday, six men identified by fellow passengers as being of Middle Eastern descent were removed from a Southwest flight bound for Houston at Chicago's Midway after they asked to switch seats, causing a commotion, the local ABC affiliate reported. "Our crews were unable to resolve the situation without delaying the flight so we rebooked the customers on a later flight that same day," Southwest said in a statement. The following day, a Spirit Airlines flight en route to Minneapolis returned to Fort Lauderdale after a young passenger "heard what she believed to be a conversation during which the subject made a remark about blowing up the plane," according to a police report quoted by the Sun Sentinel newspaper. Once back on the ground, Yaniv Abotbul, a US citizen born and raised in Israel, was interrogated for five hours, his lawyer Mark Eiglarsh told a news conference. Abotbul was let go, with the police report quoted by the Sun Sentinel saying "intensive interviews revealed no actual threat was made to the flight and the incident appears to be a miscommunication from a juvenile witness". His lawyer has demanded an apology both from the airline and authorities involved. Spirit Airlines did not respond to requests for comment. The same carrier was implicated in another incident, in Baltimore, Maryland, on Tuesday. A woman and three men described by fellow passengers as being of Middle Eastern descent were escorted off a plane headed to Chicago's O'Hare International Airport after a witness reported suspicious activity to the crew, the Baltimore Sun reported, citing police. In the end, police determined that one of the passengers had simply been watching a news report on a smartphone, according to the newspaper. The Council on American-Islamic Relations said the individuals were racially profiled. "These passengers were inconvenienced and forced to endure humiliating treatment and invasive questioning for no apparent substantial reason other than because their perceived ethnicity caused alarm in a fellow passenger," a spokeswoman told the newspaper. Fear is the worst enemy of civilized people, this is a foolish action taken by ignorant people. The world no longer tolerates or trusts uninvited foreigners within their borders.